Ok-nyeo-am is a strange Shamanic place, with dozens of statues of deities on outdoor display, including various Buddhas, Guardian-generals and Dan-gun. 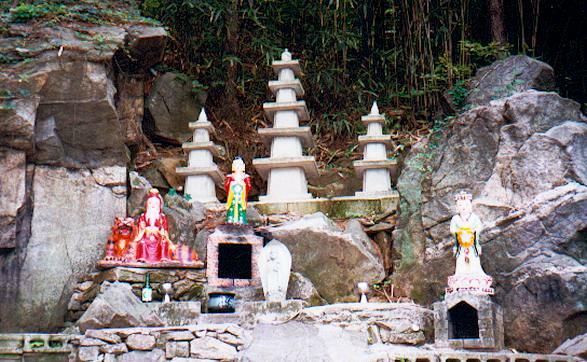 Among the boulders at the back, San-shin and two attendants are found with 3 stone pagodas. 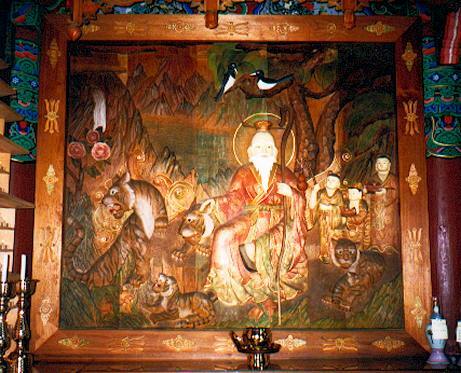 Yong-ho-sa displays a rare wooden-relief San-shin icon with a whole family of 5 tigers, 3 boy-attendants and 2 magpies above. 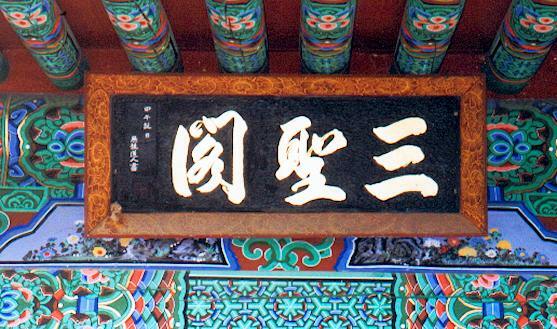 Good calligraphy on the Sam-seong-gak signboard. RIGHT: In front of the Deok-seong relief. L to R: Cheong-un-seunim, the chief monk of Yong-ho-sa (a very pleasant and interesting monk), myself, David Kenat Jr. (grad student in Korean Philosophy), and Dr. Ryu Je-heon (professor of Cultural Geography at Gyowon-dae in Cheongju City). 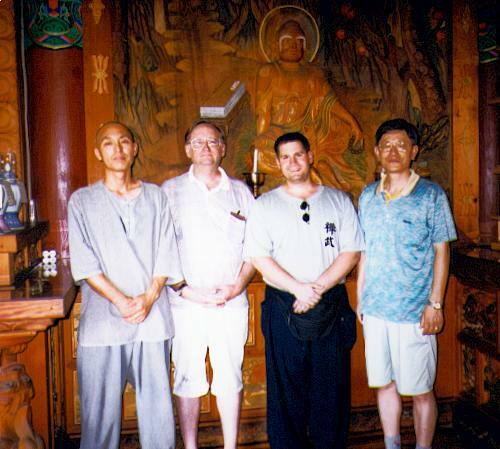 The three of us were hosted by Venerable Cheong-un during this part of our exploration of U-am-san in July 2001. LEFT: this San-shin appears to have a really terrible hangover and consequent sour mood. 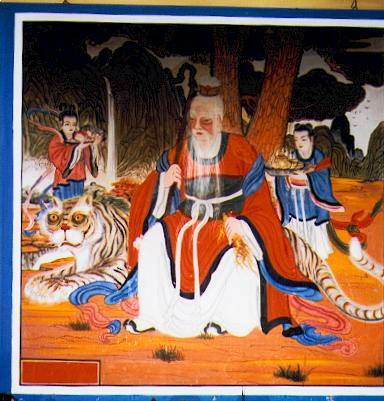 He grips a ginseng root in his left hand, the angelic girl brings him fruit and the boy brings hot tea, all of which he sorely needs... the slightly surrealistic tiger looks like he's still wired up on some kind of drug. 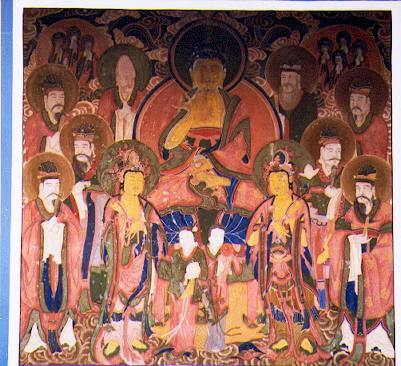 RIGHT: at the bottom of this Chil-seong [Seven Stars] painting, a pair of dongja attendants hold the Moon and Sun (yin-yang symbols) instead of the Bodhisattvas as usual; this is extremely rare. Refer to pages 104-109 in my first edition.